This isolated narrow gauge operation is an absolute delight. 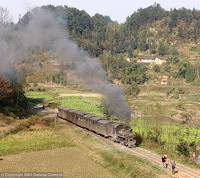 The scenery is superb, the gradients are steep, the rolling stock is in a class of its own and the locals are friendly. All it needs is some sunshine to bring it to life. The catch is that this part of Sichuan experiences more cloudy, wet weather than Manchester. Fortunately the clouds do break occasionally.